We had someone donate to a food drive a tasty bite lentil bag. We are going to look at this donation versus cooking from scratch with organic products to see how you who donate to Jeffco Eats can get the most for our children and families consistently all year round. So 60 oz of lentils is $10.73. In pounds of food which includes sauce in packets that is 4 lbs of lentils with sauce for $2.68 a lb for lentils with sauce. 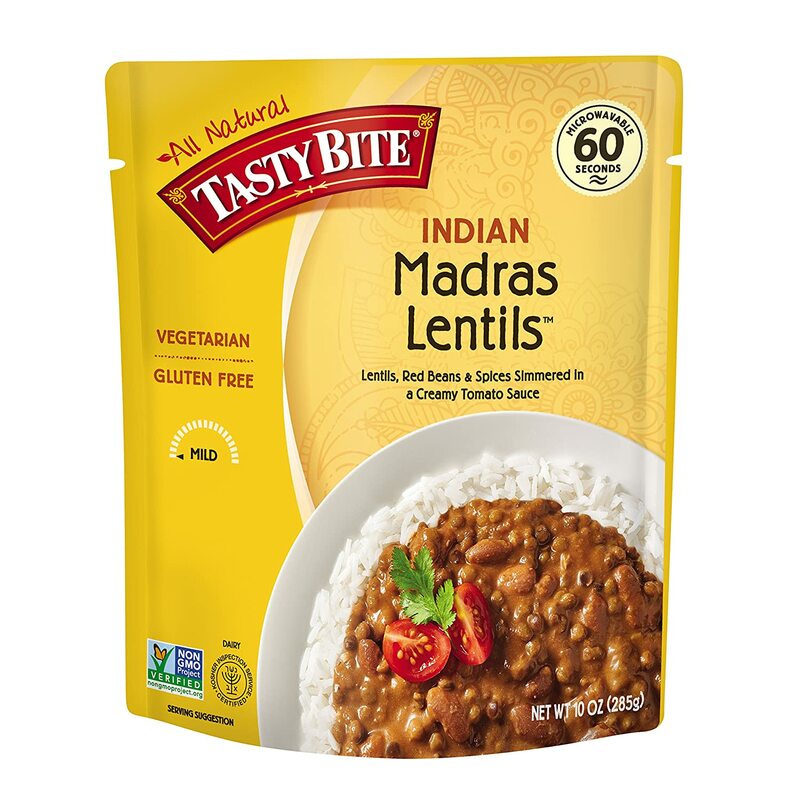 How much lentils could we make with a lb of lentils we could purchase at Vitamin Cottage or King Soopers ? It is $1.91 for a pound of green lentils. How Many Cups Does 1/4 Cup of Dry Lentils Make When Cooked? One-quarter cup of dry lentils makes about one-half to five-eighths cup cooked lentils. As a general rule of thumb, dry lentils approximately double in volume when cooked. So one pound of lentils will make two pounds of lentils so that would be about $.95 a lb but then you make lentils in sauce. Says referance.com but we have another measure that seems more accurate. Note that one pound (16 ounces) of dry lentils yields about 7 cups cooked. Remember, no soaking is required for cooking lentils. We will do some cooking classes with our High School program teachers at Brady High and McLain high to provide you with what they found out about the economics of eating smart and healthy. Lentils have been sustaining humans for thousands of years. Some foodies once considered lentils to be poor man’s food and refused to eat them because they are so inexpensive. Although they may be cheap, lentils are very nutritious, filling, and arguably the most flavorful of all the legumes. If you are a vegetarian, vegan, have diabetes, or follow a gluten-free lifestyle, lentils are a great substitute for some foods that are missing from your diet due to your restrictions. For example, lentils can be a good source of the iron most commonly found in red meat and are high in potassium if you’re diabetic and need to find something to replace that banana. Lentils have a very low glycemic index and resistant starch content, which make them suitable for a diabetic diet. Lentils are also gluten-free and are essential in the gluten-free pantry for making bread, muffins, fritters, and pancakes. Lentil flour is used a lot in Indian cooking and is perfect for vegetarians who want to bake as it will provide missing nutrients. 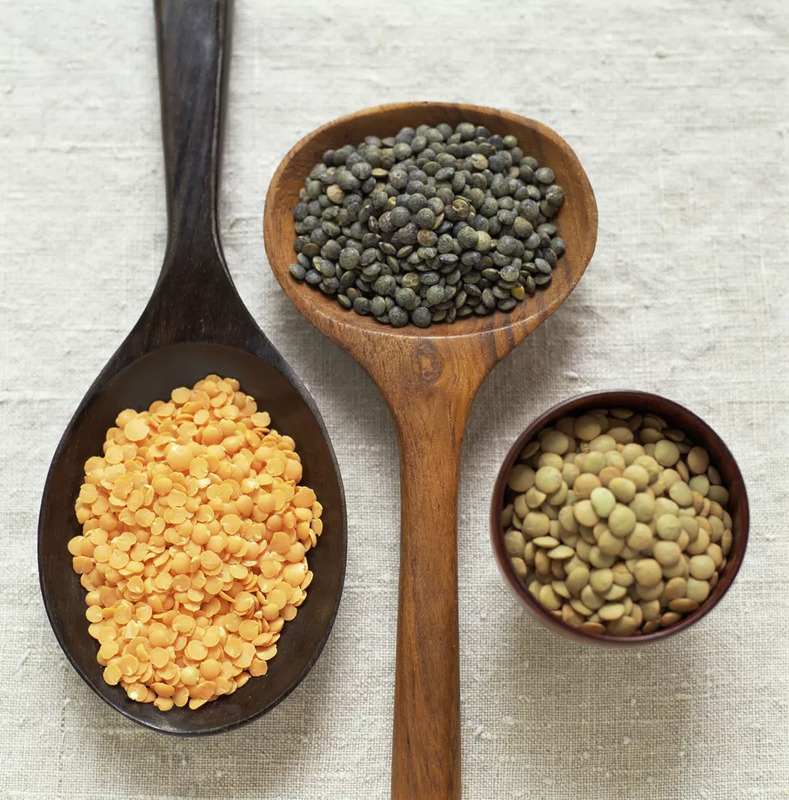 High in fiber and complex carbohydrates, lentils are a great option for those who have low-fat or low-calorie diets. For vegetarians and vegans, lentils are a good replacement protein; 1/2 cup of dry lentils, which yields just over 1 cup of cooked lentils, has about 26 grams of protein. It is also the equivalent of 80 percent of your daily fiber requirement. If you are on a gluten-free diet and are restricted from a large segment of wheat-based, fiber-containing foods, turn to lentil for a good fiber source. An increased intake of fiber has been shown to lower blood cholesterol levels and may protect against developing colon cancer and diabetes. Potassium is good for counteracting an abundance of sodium in your diet and may help your body lower or regulate your blood pressure. Bananas are usually known to be the potassium powerhouse, but for those who are on a strict diabetic diet, a large banana is not recommended. Luckily, 1/2 cup of dry split red lentils has more potassium than a large banana. When looking at vegetarian options, lentils are the top source of folate of all the plant-based foods. Folate, also called vitamin B9, is essential for women who are pregnant or who want to become pregnant. Folate helps the body create DNA and other genetic material and supports red blood cell formation and nerve function. Folate is shown to lower artery-damaging homocysteine, may help prevent anemia, and studies show it can protect against developing heart disease, cancer, and dementia. A half cup of dried lentils is the nutritional equivalent of 100 percent of your body’s manganese requirements and can meet nearly 50 percent of your iron needs. Manganese plays a role in maintaining normal blood sugar level and helps protect against free-radical damage. Free radicals can trigger a number of humans disease by unbalancing the immune system and speeding up the aging process. A big source of manganese is whole wheat, a restricted food if you have gluten-sensitivities or celiac disease. Since the highest iron-containing foods are meats, if you are vegetarian, you need to find an iron source elsewhere, and lentils and spinach are going to be your main plant-based sources of iron. Iron plays an important part in forming hemoglobin in the blood. Hemoglobin carries oxygen to your cells. If your body is lacking in iron and hemoglobin, you may feel lethargic and tired. This is a potential sign of anemia, the condition when your red blood count drops too low. For the most part, you can substitute any color lentil for another, although some do cook up firmer than others. It helps to know the ins and outs of cooking lentils. Red, yellow, and orange lentils cook the fastest since the seed hulls have been removed. If cooked too long, these lentils can lose shape and become mushy. If your lentil recipe calls for a lentil that should retain its shape when done, common brown lentils are a good choice. These are the easiest to find in grocery stores. Brown lentils still have their seed coat and have not been split. As you are measuring out your lentils, carefully pick through them. Lay them out and check for small lentil-sized pebbles that sometimes make it into the package. These little rocks can sneak into stews or soups and be an unwelcome surprise. Whether you are following a lentil recipe or substituting lentils for another ingredient, you may need to determine the quantity of dried lentils needed. A few equivalents will make this conversion simple.